This is a gorgeous glossy mag that’s distributed up and down the South Coast of NSW. I’ve had the privilege of interviewing and writing about some incredibly interesting people. And I’ve also covered some fun topics too. Most notable was interviewing Collette Dinnigan after her refurbishment of Bannisters apartments. I’ve spent a memorable afternoon with author Kate Howarth and a lovely morning with sculptor Ross Cameron. Indigenous artist Merryn Apma was an absolute joy, as was Indigenous photographer Shannon Mason. The girls at Juela Mogo were wonderful to work with and a retrospective piece on Charmian Clift taught me much about Australia’s literary history. I’ve also documented the popular EAT Merimbula food festival, the journey of the injured turtle ‘Diamond’ back to the ocean wild and supported the launch of the coffee table book Sapphire. 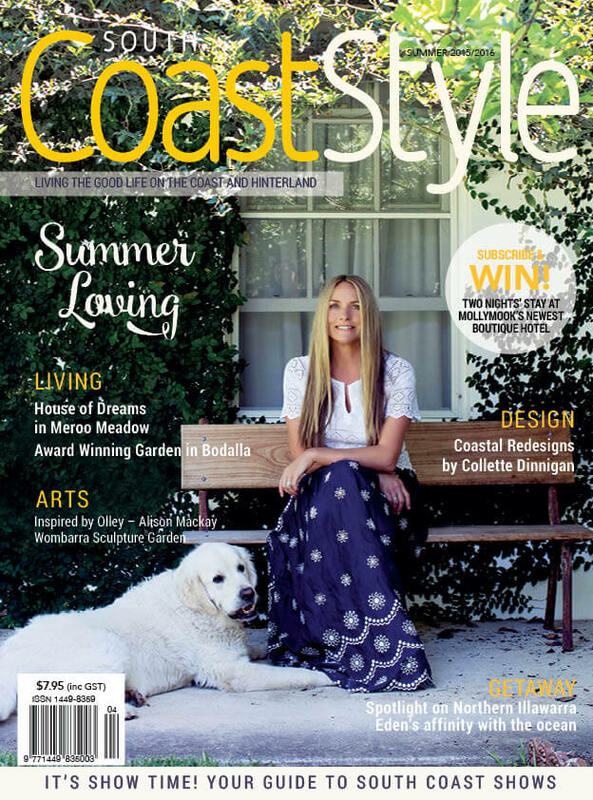 All in all, my work with South Coast Style mag is always interesting and inspiring.